This summer I’m helping raise awareness about the importance of keeping your pet hydrated as part of PetSafe Canada‘s Pet Hydration campaign! Did you know each day your pet needs 70 mL of water for every 1 kg they weigh? That means depending on their size, cats need at least 300 mL of water each day and dogs could need between 600 mL up to 2,500 mL! In the summer, you have to make sure they’re getting enough water and one way to do that is with a free-flowing pet water fountain. Artie is loving his water fountain! Thor, Loki, Olive and Artie all love free-flowing, running water. Thor and Loki will regularly drink from the sink and bath tub taps. Artie loves catching water from the hose. And Olive likes when I drip water on her after a shower. Always make sure your pets have access to water in the summer! I bring lots of water (and a travel water bottle for pets) when I take Olive and Artie for long walks (especially if it’s hot + sunny out). I make sure their hydration is handled no matter where they are – at home or when we’re out. And now I’m excited to give you an opportunity to win a fountain to help keep your pets hydrated this summer! 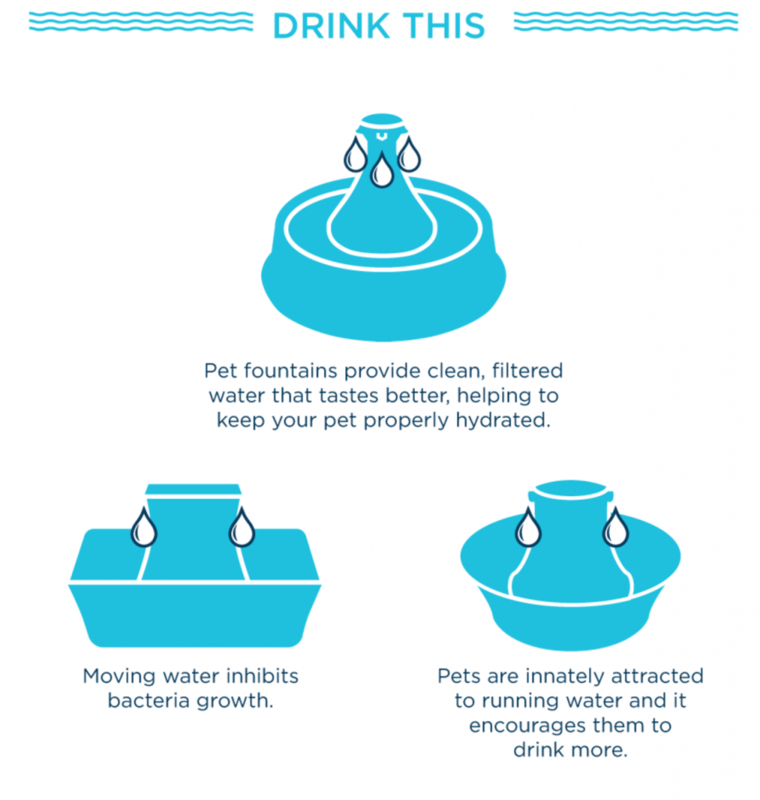 Pet fountains are great for cats and dogs! Enter to win a PetSafe Canada Drinkwell Ceramic Avalon Pet Fountain (valued at $119.99). Note: In order to win, you must live in the Greater Edmonton Area or be able to pick up the prize in Edmonton. Retweet my tweet about Pet Hydration! I will select a random winner across all platforms by August 4, 2017. In the meantime, be sure to watch for signs of pet dehydration and make sure they drink lots of water this summer! Disclaimer: I will always provide my 100% honest opinion on this blog. I am partnering with PetSafe Canada to help raise awareness about pet hydration. This does not impact the opinions stated in this post. Olive/Artie/Thor/Loki love their new fountain and I’m passionate about keeping them happy + healthy! Jimmy our cat loves water! Anytime we top up the bowl he could sit there for a solid 3 minutes drinking! We’re greatful he loves his H2O. My sweet Mickey (cat) is obsessed with running water from the taps. I think he would love this fountain! Thanks for the chance to win this! Keep up the awesome posts! Hi Linda! What an AWESOME giveaway!! We just adopted our puppy Pickles from the Edmonton Humane Society and he would absolutely LOVE this! He’s part pyrenees and VERY fluffy and really isn’t loving the heat waves we’ve been having! 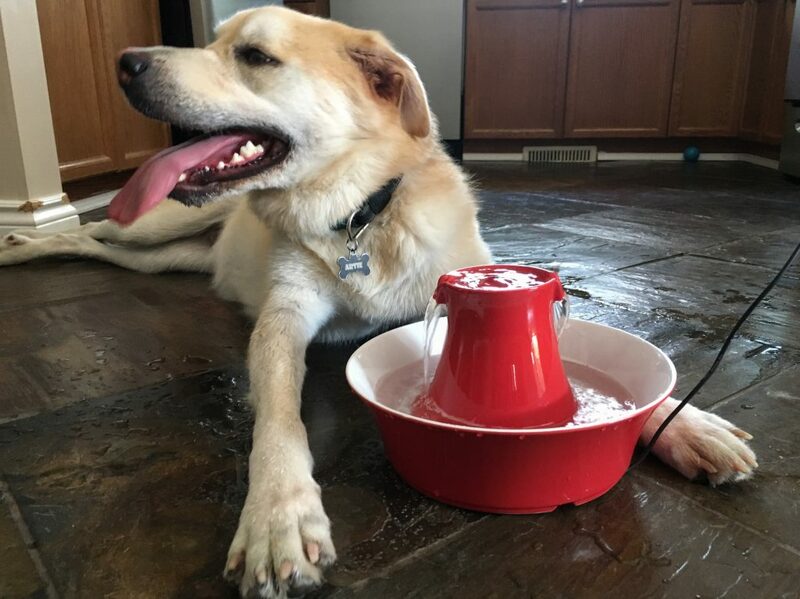 We’ve been having to leave him two giant bowls of water when we head off to work in the morning just to make sure he will have enough – but this looks like it would solve that!! He’s very funny when it comes to water, for one, he always seems to think there is treasure at the bottom of the bowl, and he seems to forget to swallow his last gulp and we can always find him in the house by following the water trail from the water bowl! LOL! My 14 year old pug, Fogg, is a messy drinker. It never fails! Every time he drinks his water, he leaves a path of soppy destruction in his wake. My cat Toes use to sit in her water bowl while she ate her food. And during the spring thaw her favorite activity was playing in the mini rivers that would form in the yard. Hates a bath through lol. My black lab Shadow absolutely loves the water-he will jump in anywhere and go for a swim-but he hates the bath lol and will try to hide when he knows it’s time! Our cat will not drink out of anything other than a glass. We have tried bowls, dishes, nothing works. He’s a little weirdo. Needless to say, this would be for the dogs. Haha! My dog Emmett is the messiest water drinker. He leaves behind large puddles on the floor and has to lick his feet dry after drinking. Our pup, Layla, is not a fan of the water except if it’s a sprinkler. She goes wild when we try to bathe her but put a sprinkler in the yard and she spends hours trying to catch the water, getting soaked along the way. My cat Waffle likes to dip his paws in and then lick the water off. My dog Thornly spills most of it outside the dish and Bramble our dog, is nice and neat! My dog Jack loves wading in the river in Terwillegar park. What is hilarious is that he avoids swimming, even though he’s actually a great swimmer. He pops up and down in the water, like he’s on a trampoline. It’s hilarious to watch. One of our cats likes to do the dip the paw into the water and then lick it off and the other one so cutely sticks his whole little head into the well part and drinks away. When my dog jumps in the river, she scoops the water with her mouth like a whale eating krill. It’s hilarious! Thanks for the chance to win this awesome fountain — I am doing all 4 things! My rescue kitties, Mouse and Minnie had a stainless steel fountain that they absolutely loved, but recently, the motor pooched, and I was unable to replace the fountain (it was pretty expensive). I didn’t want to get them a cheapy plastic because – ugh – and, well, plastics are not good for humans or animals. Steel and ceramic are definitely the way to go. Mouse dives right into the water when she is ready to drink, but Minnie approaches cautiously and has to look at the water for a bit first. Then, she scratches the mat (where the water dish sits) a few times. Sometimes, she sticks her paw in the water and then licks it. And finally, she drinks. Cats can be so quirky — just like us! Our puppy Ruby drinks laying down with her chin in the bowl. Her beard looks so silly and drips everywhere. She gets more water on herself and on the floor than she actually drinks! It’s like living with a wet sponge. 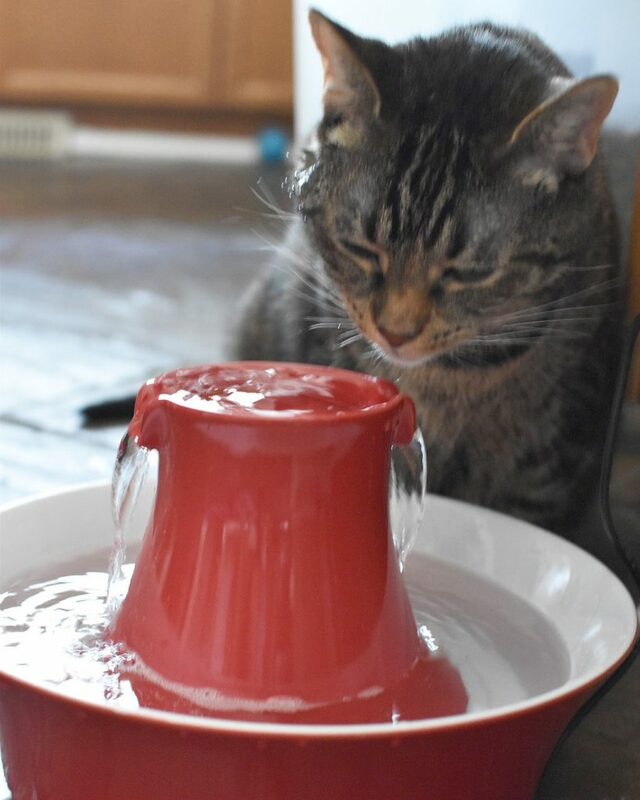 We put ice cubes in our cats water dish and watch them push it around!